By switching from electric to propane gas. "Suhre's Gas Co. has been the "PRO in PROPANE" since 1934"
Try us out and see why we really are the "PRO'S" at what we do! Suhre’s Gas Co. refills your BBQ cylinder (20# cyl). Drop them off at the office for a refill that is cheaper than exchanging and you keep your bottle. 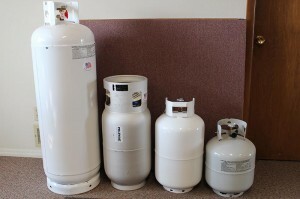 We also sell propane cylinders in a varity of sizes: 100#, 33# forklift, 30# & 20# for use in homes, shops, forklifts & RV’s. Looking to add a fireplace to your home or want to heat your shop? We also carry small tanks that can be set against the house in 120 gal and 57 gal sizes that can be filled off of a delivery truck, saving you from transporting the cylinders. Safe Cylinder Transportation and Storage is very important. Take a minute and look through the PERC Interactive Module to make sure you’re always safe. 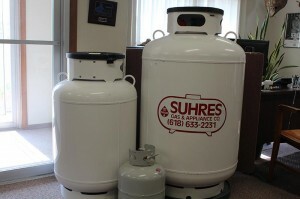 Suhre’s Gas Co. is a family owned independent propane (L. P. Gas) dealer established in 1934 as a grocery and hardware business selling propane cylinders. Because of propane’s exceptional versatility, it has evolved and grown to be our core business. With a 79 year commitment to the propane industry, this experience, along with our industry trained employees, can provide our customers with the exceptional service for all their propane requirements. For the residential market, Suhre’s delivers the economy and convenience of propane to areas not serviced by natural gas. Suhre’s Gas Co. also operates a mini storage facility next to our office building. We offer 150 storage units in sizes from 5 x 10 to 10 x 40. Mini storage units are great for short term or long term storage of that little stuff that fills the garage or the boxes stuffed in the basement. We have 9 x 21 units that are great to store that old car that sits out in the drive way. CLICK HERE, to visit our online reservation site. Suhre’s sells two top quality – MADE IN THE USA grills. Broilmaster has been manufacturing Premium Gas Grills every year since 1966 in Belleville, Illinois. The Holland Grill is not an “ordinary” gas grill. Great food, no flare-ups and hassle-free! Remember–if you’re lookin’, you’re not cookin!.